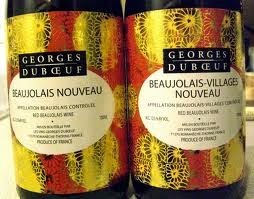 Remember this Thursday (Nov. 20) Beaujolais Nouveau is released all over the world. Nouveau is made from the Gamay grape and sent to market only 6 weeks after harvest! It is fresh, straightforward, and simple wine drinking at its best. In France, it is the cause for a national celebration observed annually on the third Thursday of the November with the wine being out for sale at the same time around the globe. It will cost you around $10 and Georges Duboeuf is the ubiquitous negociant although other "brands" should be fine. If you happen to find a "Beaujolais Villages" Nouveau plan to spend another couple bucks. At any rate--if you are into wine at all, you need to be a part of this annual ritual joining millions the world over drinking the same thing on the same day world wide so: Raise a Glass!